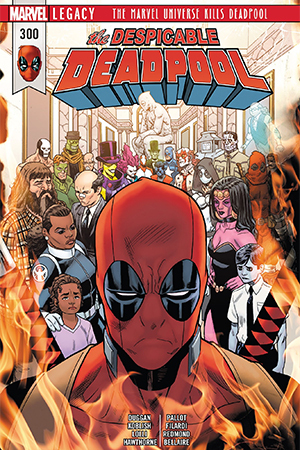 Despicable Deadpool reaches the big three-double-zero as well as the end of Gerry Duggan’s long and fruitful run on the book, and Wade celebrates his 60 year anniversary with a mix of gross-out humor and eat-your-heart-out pathos. It’s the kind of balance we’ve come to expect from Duggan’s take on the character, though it may lean a little much on the former for some reader’s liking. Plot: Despite having put a hit out on himself, Despicable Deadpool #300 opens with the reminder that no one can really kill Wade Wilson. To make matters worse, he ingested a “restricted” drug that induces such violent vomiting that him enemies will wish they were dead instead – especially because it’s contagious. Once all the heroes have doubled over and fallen into their own sick, the only option left is for Wade to take makes into his own hands. That is, unless Captain America and the newly revived and restored Agent Preston can get to him first. Story: If you make it through the first twenty pages of Despicable Deadpool #300 without feeling a little queasy yourself, then you have a strong stomach indeed. Deadpool may be known for body humor and sight gags, but this particular joke gave off the impression of needing to kill a couple of extra pages, no pun intended. Once you’ve made it out of that section alive, though, there’s a lot of great stuff in store for fans of Duggan’s take on the character. For example, the fourth wall-breaking that Deadpool does so well takes on a whole new level of significance when Duggan himself shows up in the story to acknowledge his role as the longest-running writer for Wade and to apologize for everything they’ve put him through. It’s more than just a fun nod, it’s also a reflection of everything Wade stands for and a piece of foreshadowing for the end of the issue. Because, boy, does the final section of Despicable Deadpool #300 make a controversial narrative choice. Reset buttons are hotly-debated topics in longform fiction, often either seen as a cheap way out of a touch spot or else a clever way to leave a clean slate. 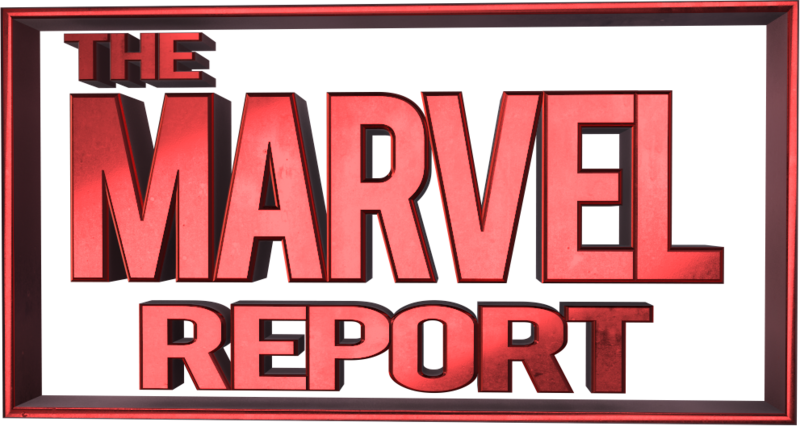 While I would personally rather never see a reset button hit on character development, and certainly not on some of my favorite development for any Marvel character in the last few years, I will admit that Deadpool‘s post-Secret Empire arc has perfectly set the stage for Wade to make the decision he does. And by incorporating some of the key protagonists of the run, not to mention providing what amounts to a Best Hits rendition of the previous two years, Duggan manages to help readers come to terms with the ending. It’s almost like going through the five stages of grief in a single issue – how many comics can you say that about? Art: Duggan brings a whole host of collaborators with him to say farewell to Wade Wilson in Despicable Deadpool #300, and seeing the different eras of his story laid out so visually helps bring a sense of closure to the issue. Of course, everyone has their own favorite artists, but all of them do solid work here and highlight the aspects of their style that make them (and Wade) unique. Hawthorne is perhaps the most prolific, so it’s only fitting that he gets the cover art as well. Overall, there’s a sense of love for the world and story imbued in each and every panel, regardless of the artist. 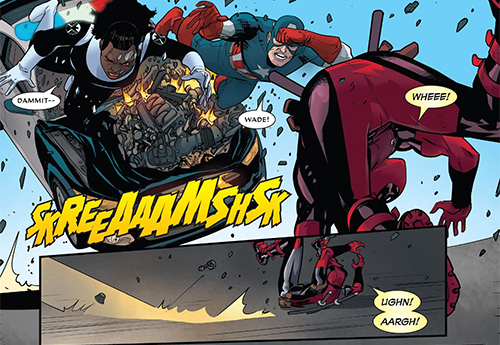 And it’s a lot of fun getting to see different takes on not only Wade, Steve Rogers and the Avengers, but also Deadpool-specific characters like Agent Preston, Ellie and Shiklah. Despite the varying styles, having so many talented artists on display one right after the other only serves to accentuate the cohesive aesthetic of Duggan and Hawthorne’s run, with no pages feeling out of place despite artists adding their own flavor to the character designs and backgrounds. 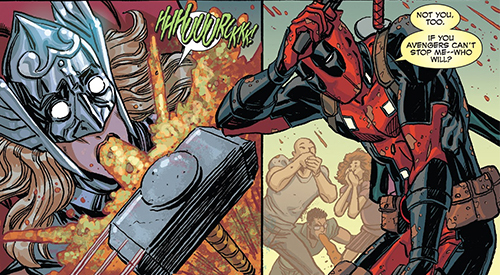 Verdict: Despicable Deadpool #300 is a lovingly penned and colored farewell address, which acknowledges Wade’s growth without tying future writers to it. And while that choice may frustrate many readers, myself included, at least it packs an emotional punch with it – despite spending a little too long on gagging gags – and reminds us of everything we’ve loved about his story since 2016.